The poles and planks have now been removed from our hire boats and we’ve started the winter maintenance. Bookings are already coming in for the 2015 season so there’s plenty for us to be getting on with. It’s best to make sure that your winter preparations are done before the waterways have frozen – if you don’t have time to do it yourself, book it in to be carried out by our staff team before the cold sets in. If you plan to winterise the boat yourself here, are 3 basic steps to help you protect your narrowboat or canal boat from the cold. Condensation and water dripping from the windows, the stern gland, the weed hatch or the deck can all result in water collecting in the bilge and engine compartment. Clear any mud, leaves and debris from the scuppers, deck, gunwales, roof edges and channels around the roof hatches. Make sure that any extra water does not originate from a plumbing or engine leak. Then, to prevent hull corrosion, grab some bilge cleaner from the chandlery, use according to instructions, and pump out any excess water from the bilge. If you leave that water sitting there, it could encourage the growth of bacteria and emit a nasty smell after a few weeks. If the water contains any oil or grease this should be pumped into a container and disposed of responsibly. Boatyards or local councils can advise the nearest place to safely dispose of oil; nobody wants to see it floating in the Cut! Any water left remaining in the bilge can be sponged out by hand – a lovely, messy and tedious job! The main reason to empty the water tank is that frozen water pipes can expand and burst causing a leak in the accommodation while you’re away. But the second reason is that any water left in the tank for some time will develop bacteria and odours and become unpleasant quite quickly! Run the tank as empty as you can by opening all the taps, and then switch off the electric water pump. You’ll hear the strange sound of the buzzing pump motor when the tank is empty. Don’t let this run on for more than about 30 seconds or you’ll risk damaging the motor. When you leave the boat you should leave the taps turned on and the pump turned off. In the bathroom, leave the showerhead hanging loose in a way that allows any water to drain out. It’s also advisable to empty and rinse your pump-out or cassette toilet. Turn off the 12 volt electrics using the battery isolation switch and turn off the propane or butane gas supply. Check that any 240 volt supplies are also turned off and left safe. Safely store a generator in a gas-tight locker. Then remove anything valuable, close the curtains and lock the boat up securely. This is by no means an exhaustive list of jobs to do, every boat is different. If you have some good tips for ‘winterisation’ feel free to share them with us on our Facebook page. Disclaimer: These tips are for guidance only. 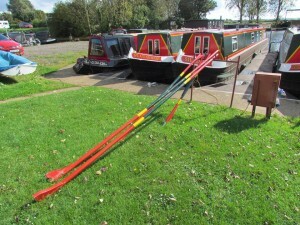 If you are unsure about any element of DIY boat maintenance pleases seek advice from a reputable marine engineer, or book the work to be done at Fox Narrowboats.